Location: In 'The Corner' of Rob's Halfway House mumbling about cookies and unicorns. It's been a year since anyone posted in here. Holy crow! 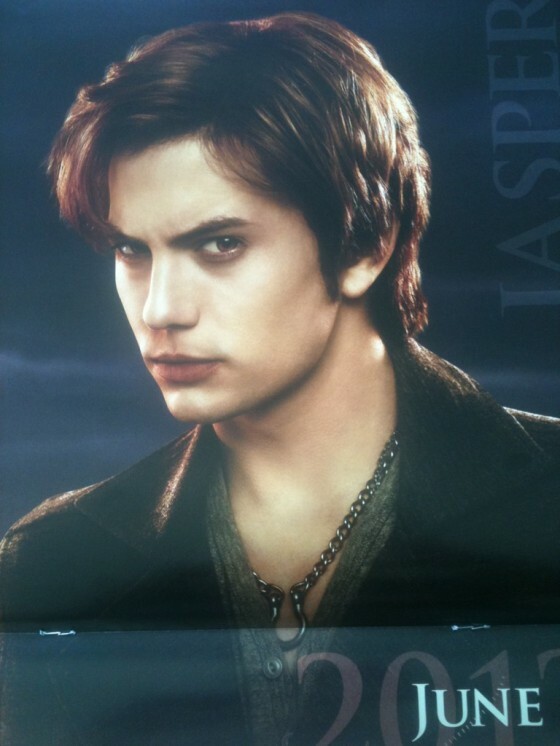 Anyway, so um...I dunno how Jackson's gonna beat his performance as Jasper in Eclipse. That was how I've always pictured Jasper. Especially the accent. I know that surprised a lot of people, but I think he didn't get to say as much in the other films for his accent to be able to come out before. After all, Jasper is from Texas. Not to mention Jackson grew up there. The pictures that came out of the calendar for Breaking Dawn Pt. 1 were horrendous. I mean, Jasper looks good, but it looks like Jackson showed up to the photoshoot & they said "meh, you don't need makeup or a wig. We'll just take pics of you like that." Seriously though, look at him! His hair is brown & he's wearing his own necklace. I srsly hope they changed his hair color for the movie. Oh and I met him again at the last 100 Monkeys show I went to. Yikes. That picture of Jasper is kinda wrong. When did he and Alice have like the exact same haircut cuz that wig looks like the one Ashley has to wear as Alice? The EC wig wasn't that bad, I just wish that it was, ya know, blonder then it was. I'm almost starting to think that maybe the movie Twilight vampires can change their appearance and that the wolves are the ones that stay the same because of the hair and makeup in each movie for the vamps is always different. So last night I had a dream where I got to meet Jackson at a screening of Breaking Dawn. I remember he was funny & showed his cute southern charm. That's about all I remember. I'm glad at least in the BD movie his hair didn't look as bad as in the promo shots. For some reason most of the Cullen's don't look that great to me in the promos. But looked fine in the movie. My favorite Jasper look is from Twilight. Congrats to Jackson for becoming the worlds most sexiest dad!!!! !